This is a one of its kind Qwiic (I2C) version Soil moisture sensor that helps you build an auto-watering system in a quick and easy way. Put the sensor’s exposed pads (probes) into the soil, and it will tell you the plant’s moisture rate from 0 to 1023 (0 means completely moist, 1023 means completely dry). 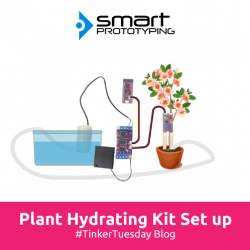 You just need to decide at which rate to water, and how much water you want to give the plant. We have provided a demo code here for your reference. The module incorporates an ATtiny85 MCU as the I2C gateway, which does all the nitty gritty stuff for you. The default I2C address is 0x28, which you can also change depending on your requirements. 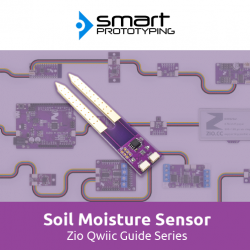 This is a Qwiic (I2C) version Soil moisture sensor that helps you create auto-watering system in a quick and easy way.